The state border services of Ukraine and Azerbaijan agreed on cooperation in combating smuggling of drugs, State Border Guard Service of Ukraine informed on January 24. 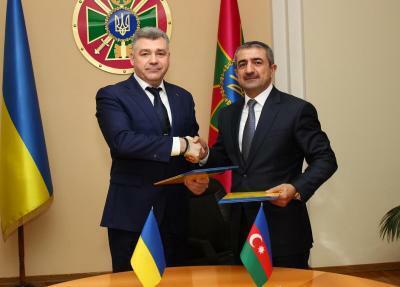 The agreement was reached during the meeting of the head of Azerbaijan's State Border Service Colonel General Elchin Guliyev and his Ukrainian counterpart Petr Tsigikal. The two countries will also cooperate in the professional training of special force units. The sides agreed to exchange experience in countering border security threats and conducting joint risk analysis in the field of state border protection. Guliyev and Tsigikal also discussed the use of modern technical means to effectively protect borders from cross-border crime and terrorism, as well as agreed on the preparation of a plan for cooperation between the border services of the two countries for the coming years. The activities of Azerbaijan's State Border Service air aimed at maintaining the country's border safety and combat any possible border security threats, including international terrorism, drug trafficking, smuggling, illegal migration and other cross-border crimes. Today Azerbaijan continues a resolute fight against drug trafficking, which is the main source of terrorism financing. The State Security Service, as well as other law enforcement agencies, is constantly fighting against drug trafficking, smuggling of drugs into the country and the use of Azerbaijan’s territory for their transit.